My furnace, its crumbling a little due to my poor homemade refractory. The beginnings of my crucible. 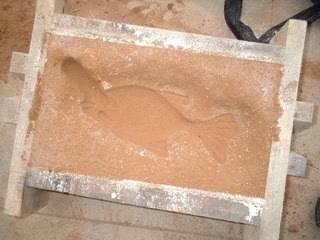 Fish casting pattern nearly finished. The other half of the sand mold. The finished casting, it took two tries to get the right the first one (below) had a shrink cavity that made it look a bit anorexic. Casting gone bad, it has a shrink cavity. The furnace burns wast vegetable oil, to do this I built this simple oil burner. It's simply a copper coil imbedded into a refractory lining. The end of the pipe is hammered into a small nozzle for the oil to drip through. The very base is filled with Perlite. Perlite lining in the base of the pan. The pan is just an old stainless steel cooking pan. This is the copper preheat coil. Refractory lining. The lining is made from bentonite clay and sharp sand. I followed the instructions by Dave Gingery for this refractory. Before the burner is used it must be preheated using coal or wood. you could possibly want to know about backyard metal casting! Testing the flame! This is on the lowest oil flow setting, which is controlled by the little flow valve you can see in the bottom left.